2019 Colorado Ski Area Closing Date Extensions! DENVER – March 21, 2019 – As March winds down, Colorado’s ski areas are in the midst of a great spring season with ideal conditions for experts, guests ready to learn to ski or snowboard and everyone in between. Late season features warmer temperatures perfect for learning or for those looking to enjoy a non-skiing activity or the mountain environment. Colorado Ski Country USA (CSCUSA) member ski areas will host events and activities throughout the spring including free concerts, pond skims, competitions and even kayak races. Lower late season lift ticket prices can also be found. Below is a selection of events across the state and up-to-date closing information including season extensions. Arapahoe Basin will celebrate closing weekend with live music on Saturday, June 1 and Sunday, June 2 at the Mountain Goat Plaza. Guests can enjoy springtime’s longer days, sunnier skies and great snow conditions with a free, family-friendly concert from 1 p.m. – 4 p.m. For more information, visit www.arapahoebasin.com. The Après is a brand new three-day music and mountain festival that will be held on the snow at the base of Buttermilk during closing weekend. Featured artists include Umphrey’s McGee and The String Cheese Incident, among many others. Aside from musical performances, all four Aspen Snowmass mountains will be open for skiing, riding and celebrating spring. 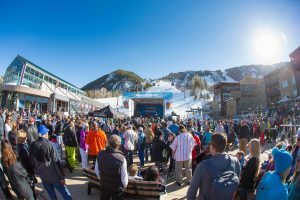 Hosted at Snowmass during closing weekend, the Elk Camp Surf & Snow Beach Party will include a live DJ, a swimsuit ski parade, hot tubs, drink specials, margarita bike blenders and plenty of raffles and giveaways. For more information, visit www.aspensnowmass.com. Cooper’s closing weekend will feature many festivities for guests including a Ski with a Ranger program and live music. From April 1-7, 2019, Cooper will offer daily lift tickets for only $25. For more information, visit www.skicooper.com. Copper Mountain will bring a twist to the traditional pond skim with the 8th annual SlopeSoakers contest. Competitors will have the chance to strut their stuff across floating rails, helping Copper end another winter season in style. On Copper Mountain’s Closing Day, the Retro Shred-a-Thon will return with retro gear to raise funds for injured mountain action sports athletes. Guests are encouraged to reach out for pledges and donations to the High Fives Foundation and wear throwback gear including one-piece snow suits, shaped snowboards, long poles and straight skis. For more information, visit www.coppercolorado.com. Granby Ranch will end the season in style with a last hurrah pond skim. The event will include a Tiki Bar, outdoor grill, live DJ and hula hoop contests from 11 a.m. – 4 p.m. For more information, visit www.granbyranch.com. Loveland will ring in closing weekend with a live performance from A-Mac & The Height. Guests can enjoy excellent spring skiing, drink specials and live music from 2:30 p.m. – 5:30 p.m.
Loveland Ski Area will team up with Never Summer and Toyota for the 2nd Annual Neverland Banked Slalom. This classic snowboard race will take place off Lift 6 and all ages and abilities are welcome. For more information, visit www.skiloveland.com. Monarch Mountain’s signature event, Kayaks on Snow, offers family-friendly fun all afternoon. From 11 a.m. – 2 p.m., contestants in kayaks will race head to head, like Skier Cross, down a specially designed course with berms, banks, and bumps, ending in an icy pond. After the event, awards and an after-party will be hosted in the Pioneer Room. On Monarch Mountain’s last day of the 2018-19 season, the ski area will host tailgate BBQ’s and beach chairs in the parking lot, with judges awarding the top dishes a season pass for next season. The Gunbarrel Challenge is a race to run up and ski down the famous Gunbarrel run with the winner earning free swag and awards. For more information, visitwww.skimonarch.com. One of Powderhorn’s most popular events, the pond skim will allow contestants to test their luck across Powderhorn’s man-made pond. Music for the skim will be provided by Powderhorn’s very own DJ Chanaconda with live music by Rapidgrass on the deck. For more information, visit www.powderhorn.com. Purgatory Resort will celebrate nearing the end of the 2018-19 season with a pond skim on April 7, featuring a live DJ and an appearance from Ska Brewing. A prize ceremony will award the winning contestants for best skim, best wipeout and best costume. For more information, visit www.purgatoryresort.com. To kick off closing weekend, Silverton Mountain will host Brewski, an afternoon of beer tasting with Colorado’s finest microbreweries. This year, the theme is Canadian Tuxedos and Daisy Dukes, and guests are encouraged to rock their favorite denim atrocities. For more information, visit www.silvertonmountain.com. The closing weekend of the Yard Sale! Spring Music Series at Sunlight will feature live music from Whiskey Stomp & Friends starting at 2 p.m., plus end-of-season retail sales on gear and apparel. For more information, visit www.sunlightmtn.com. Telluride will host a closing day pond skim at Gorrono Ranch featuring DJ Soul Atomic. The pond skim will be from 12 p.m. – 2 p.m., followed by live music and family-friendly festivities. Immediately after the mountain closes, a concert in the Mountain Village Heritage Plaza will be keeping the party going. For more information, visit www.tellurideskiresort.com. A long-standing tradition, Winter Park’s Spring Splash will feature skiers and riders struggling through obstacles on the Larry Sale Trail Race Course and attempting to skim across an icy pond to reach the finish line. Closing day will also feature spring-themed costumes and a live DJ at Derailer Bar. For more information, visit www.winterparkresort.com. On Saturday, April 6, college students will receive an adult lift ticket for only $50. Sunday, April 7 will be Local’s Appreciation Day at Wolf Creek, where everyone’s a local. With no proof of residency required, guests can enjoy $50 adult lift tickets, $33 senior lift tickets and $27 children’s lift tickets. Wolf Creek will host the Howlin’ Wolf Super G/Downhill, a true Super G from the top of Wolf Creek to the bottom, during closing weekend. For more information, visit www.wolfcreekski.com. Colorado Ski Country USA (CSCUSA) is the not-for-profit trade association representing Colorado’s 23 ski & snowboard resorts. CSCUSA is the global voice of the Colorado ski industry. The Association’s primary functions are concentrated in marketing, public policy and public relations. Information about CSCUSA and its members can be found at www.ColoradoSki.com, on Twitter @ColoradoSkiUSA and on Facebook at www.Facebook.com/ColoradoSkiCountryUSA. This release and other press information can be found in the online press room at http://www.ColoradoSki.com/Media.